MORGANTOWN, W.Va. – As part of an ongoing commitment to battle opioid addiction, the Rockefeller Neuroscience Institute (RNI) at West Virginia University today (Nov. 15) marked a major milestone, enrolling the first patient in a randomized clinical trial that will test the effectiveness of an injectable non-opioid, non-steroid micropellet to treat sciatica. 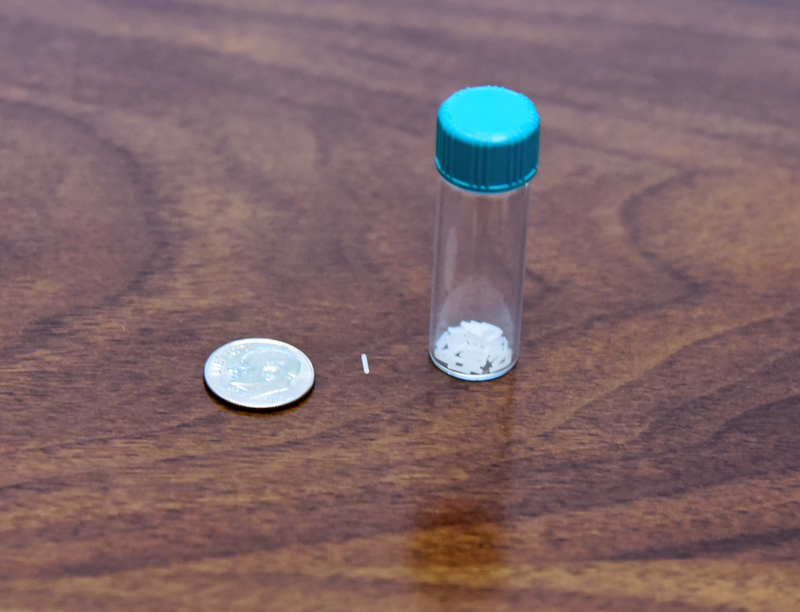 The clonidine micropellet, shown next to a dime for size comparison, is implanted in a patient's lower back to combat sciatica pain for up to one year. Dr. Rezai is not directly involved in the trial as he serves as a scientific advisor to Sollis Therapeutics, the Ohio-based interventional pain company developing the micropellet. “Having the opportunity to investigate new non-opioid treatments for sciatica and a range of pain conditions is directly aligned with the WVU Medicine Center for Integrative Pain Management’s mission to combat the opioid crisis in West Virginia and nationwide,” Richard Vaglienti, M.D., principal investigator and director of the Center for Integrative Pain Management, said. Additional patients are expected to participate in the study at WVU. To see if you or a family member might be eligible, please contact Angela Pugh by emailing adpugh@hsc.wvu.edu or calling 304-293-6780. The West Virginia University Rockefeller Neuroscience Institute is a global leader in the discovery, development, and delivery of world-class research in human performance and brain health. It includes the clinical, research, and academic missions of the WVU Departments of Neurosurgery, Neurology, Neuroscience, and Behavioral Medicine and Psychiatry, as well as several other academic departments across the university. The Institute spearheads efforts to develop innovative solutions for West Virginians and those across the world with neurological and psychiatric conditions ranging from Alzheimer’s to Parkinson’s; autism to stroke; and paralysis to chronic pain, addiction, and traumatic brain injury. For more information on the WVU Rockefeller Neuroscience Institute, visit wvumedicine.org/RNI.